A view inside the Orchestral Chamber, currently playing in the Cornue organ. Currently the 15-rank Orchestral Chamber, and Pedal Wood Open Diapason in the Foundation Chamber are playing from the two-manual Barton console originally installed in the Shorewood Theatre in Milwaukee, WI. Work is progressing steadily on the four-manual Kilgen console from Chicago's Piccadilly Theatre, and will be connected as soon as it is fully restored. 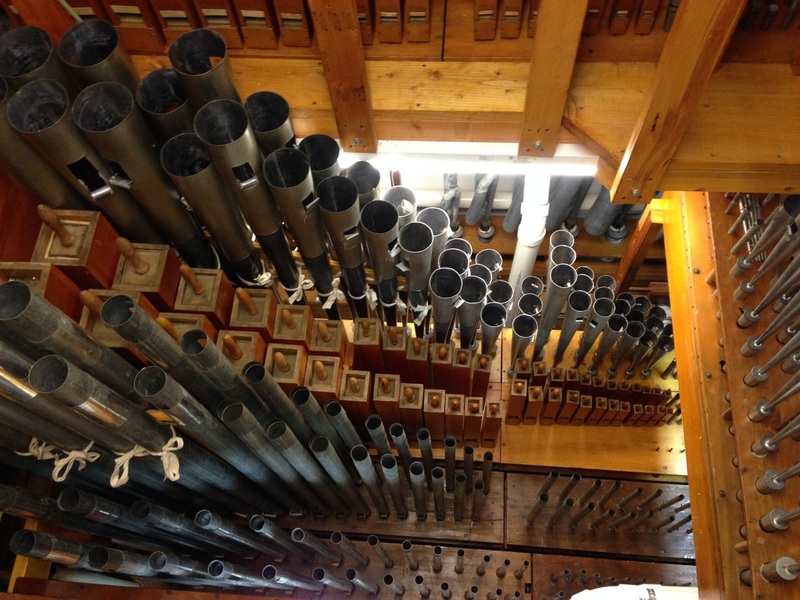 After the Kilgen console is operational, more of the organ already installed in the other three chambers (Main, Foundation, and Solo) can be connected, and the installation of more components can commence. In its final form, the organ will contain 55 ranks. While the organ definitely has a decidedly "Barton" sound, elements of other builders are incorporated as well. Come and enjoy the fun sounds of this already exciting instrument!